Lenzie’s Maia Lumsden just missed out on the biggest prize of her career so far on home ground in Glasgow on Sunday. The 20-year-old produced a series of terrific performances top make the final of the GB Pro Series event at Scotstoun Leisure Centre. But her hop-es of lifting a third ITF tour title were ended when she lost out to Spain’s Paula Badose Gibert. Maia had looked on course to add the $25,000 event to the $15,000 event titles she took at the Wirral and Sunderland last year when she took the opening set. But the Manhattan-born Spaniard - ranked 248 in the world compared to Maia’s 524 - hit backto take the next two and win the final 2-6 6-1 6-3. Maia’s run to the final began with a 7-6 6-4 win over Jodie Anna Burrage in the first round. She then defeated Liechtenstein’s Kathina von Deichmann, seeded six and ranked 335 places above her in the world, in straight sets, winning 6-2 6-3. In the quarter-finals Maia came from behind to defeat Italy’s Camilla Rossatello 2-6 6-3 6-1. And it was a similar story in the semi-final as she again dropped the first set before hitting back to beat France’s Chloe Paquet 3-6 6-3 6-4. 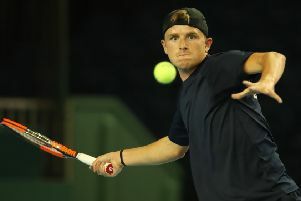 Maia’s younger brother Ewen (17) also took part in the men’s singles Futures tour at Scotstoun, but - despite a brave battle - lost 6-4 7-6 to the more experienced Colombian Juan Sebastian Gomez.